Portsmouth's Abbe Laurence (44) makes a move inside against Bishop Guertin defenders. 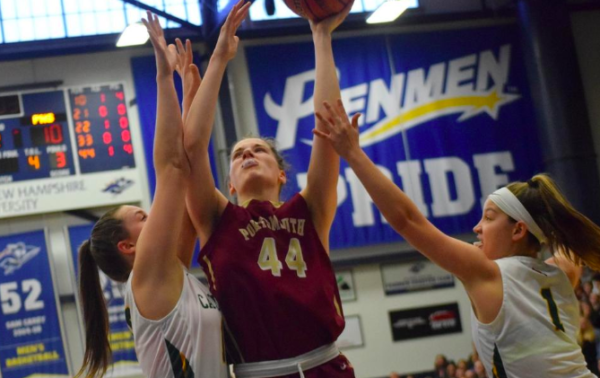 Abbe Laurence, a post player from Portsmouth High School in New Hampshire, has verbally committed to play for the University of Maine women’s basketball team starting next season. The 6-foot-1 1/2-inch Laurence, who lives in Greenland, New Hampshire, averaged 10.6 points and 10.0 rebounds per game this season for Portsmouth and helped lead coach Tim Hopley’s Clippers to a 16-6 record and a spot in the Division I title game. University of Maine head coach Amy Vachon is prohibited by NCAA rules from commenting on a recruit until the university has received a signed National Letter of Intent. The regular signing period for Division I basketball begins April 17. Laurence chose UMaine over Brown University and Manhattan and said there were several reasons she chose UMaine. “The big thing for me was the coaching staff and the players that I met. Everyone was very welcoming and they make you feel like part of a big family. They have team values,” said Laurence. She thinks the coaching staff will develop her and bring our the best in her. Hopley said Laurence is a late bloomer and the sky is the limit for her development. Hopley said Laurence is a stellar post defender thanks to her physical strength. “Defense is my favorite thing. I love blocking shots,” said Laurence. Hopley said the physicality of the college game is suited to how she likes to play the game. He also said she is a relentless rebounder and extremely coachable. “She’s a sponge. She wants to know what she can do to make herself better,” said Hopley. Offensively, Laurence is a back-to-the-basket player who has spent a lot of time working on her face-up game, which will continue to improve. Laurence was named to the New Hampshire Basketball Coaches Organization Division I all-state second team. Her older sister, Emmeline, was on the U.S. Under-19 national rowing team and is on the crew team at Yale University. Laurence is also a track athlete, a rare combination of shot putter and sprinter (100, 200, 4-by-100 relay). “She loves to run the floor. She’ll run forever,” said Hopley. Laurence was hampered slightly to begin this season, missing the first four games after undergoing offseason knee surgery. She said the knee is fine but she will continue to strengthen it through workouts. She will be among at least six frontcourt players with the Black Bears, who also feature a starter in junior Fanny Wadling, sophomore backup Maeve Carroll, sophomore reserves Kira Barra and Kat Williams and junior transfer Alex Bolozova. UMaine, which has only 13 scholarship players on the roster this season, potentially could add three more recruits for next season. NCAA Division I women’s basketball allows a maximum of 15 scholarship players. BDN reporter Larry Mahoney contributed to this report.